Robin grew up in Laguna Beach, California. Her uncommonly vivid watercolors have evolved over her 25 year art career. Robin’s art is known for its infectious optimism that can’t help but make people grin. The colors and subject matter simply say, “life, I love you!” She attended Principia College with the assistance of an art scholarship from the Laguna Beach Festival of Arts and graduated in 1976 with a BA in Fine Art. Her professor at Principia was James Green. He was a noted “California Regionalist” in the 30’s and 40’s who studied with the renowned watercolorists; Rex Brandt, Millard Sheets and Milford Zornes at the Chouinard School of Art in Los Angeles. Robin is a descendant of this bold and colorful school of art. Robin has exhibited her work in several prominent galleries in Laguna Beach including The Esther Wells Gallery, The Ruth Mayer Gallery and Gallery 224. She has exhibited her work in all three Summer festivals in Laguna as well. Her work is in private, corporate and public collections throughout the world including the California State Capital. She has illustrated books and her work has adorned wine labels from Napa Valley and greeting cards for “Leanin’ Tree” card company. Two of her local corporate clients include IBM and the Irvine Company. Robin is beginning to license her work for various companies, but her collectible giclees and originals can only be purchased directly from her. 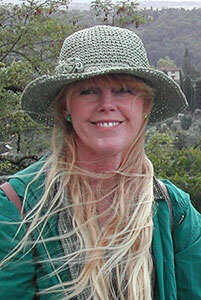 The subject matter for Robin’s landscapes are most often from Laguna Beach, Hawaii, Italy and France. Presently Robin resides in Modjeska Canyon and she exhibits every summer at the Art-A-Fair in Laguna Beach as well as The Watercolor Gallery in Laguna Beach across from the Surf and Sand Hotel.